The wearing of aprons is becoming more popular as a statement of style as well as being worn for functional purposes. Aprons: My Grandmother Used to Wear One showcases 63 aprons in Diane’s large collection – 747 and counting! Her extensive knowledge and experience of fabrics and quilts are brought to bear in the descriptions of the aprons. She gives details about the fabrics and the decorative styles and techniques used on each apron and the occasion when each would have been worn. For one heart-shaped apron in February, Diane tells us “This was possibly worn by a hostess when entertaining after having company in for a game of cards, as the embroidery echoes not only the heart shape, but also… clubs, spades and diamonds”. 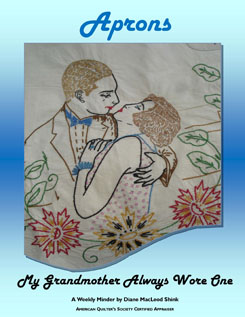 It also includes anecdotal information about her textile experiences. The pages are arranged by monthly themes laid out in perpetual style so it can also be used as a date book, one page per week. A special launch price of $25 plus $4 postage and handling per book is available for shipment within Canada. This self-published book in full colour is printed in Canada. A portion of the sales from this book will be donated to libraries in the communities where the author lives – the Children’s Library in Montreal West and the River John Library in Nova Scotia.